In mid-September, Keroman Technologies now has its own oven. A furnace 40 m long, 10 m wide and 7 m high. Five months of work, 800 000 € of investment. Today, the MACIF trimaran left Keroman Technologies, the yard which created her in 2015, after a seven-month refit designed to further optimise the performance of this reference Ultime multihull. Already a solo round the world record holder, the trimaran MACIF has been thoroughly optimised by CDK and Keroman Technologies. The scope of intervention by the yard proved to be both dense and highly technical and have all been possible thanks to the close collaboration between CDK’s design office and that of MerConcept. Indeed, since the construction of the trimaran MACIF in 2015 by CDK and Keroman Technologies, the level of confidence and cooperation with the MACIF technical team has been exceptional. The duo Paul Meilhat / Guénolé Gahinet adds a victory to their list of prizes. Winner of the first edition "Monaco Globe Series" after 3 days, 19 hours and 17 minutes of a very competitive Mediterranean race. 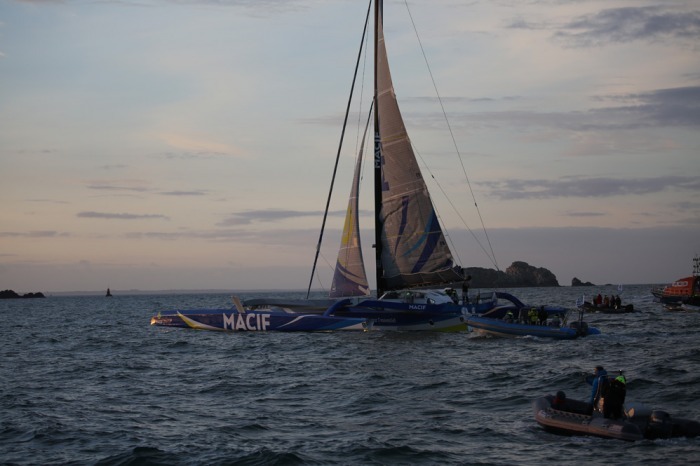 With Armel Le Cléac’h’s Maxi Banque Populaire IX exiting the KEROMAN Technologies yard early this week, it was over to the singlehanded round the world record holder, the Trimaran MACIF, to make her entrance! Indeed, on Wednesday 10 January, she went back to her beginnings at the very heart of the yard, which first created her in 2015, where she will benefit from a makeover. Objective: to be fighting fit to face the competition at this year’s next big event, the Route du Rhum, which will set sail from Saint Malo on 4 November 2018. 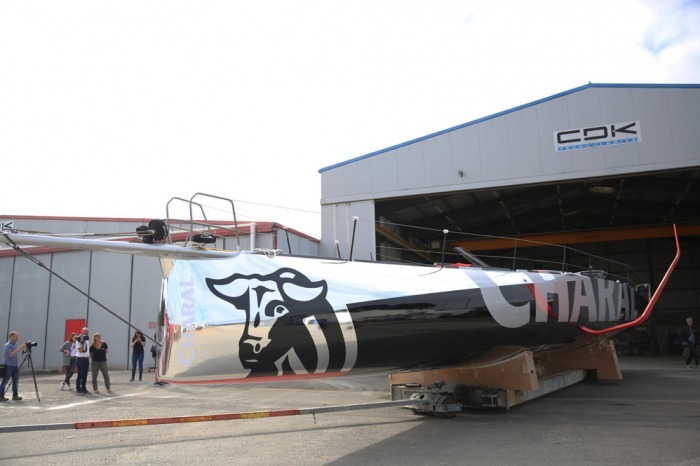 The trimaran MACIF, which came out of CDK Technologies’ workshops in 2015, is continuing to take the yachting world by storm thanks to the seemingly unreal performance of her skipper François GABART, which has earned him the new Solo Round the World Record under sail (Alain Colas Trophy) with a time of XXd XXh XXm XXs, improving on the previous record set by Thomas Coville in late 2016 by nearly 7 days. A stellar achievement, especially when you consider that Thomas’ record had itself shaved nearly 8 days off the previous time and that this latest record set by François is just over one day shy of the outright Jules Verne Trophy record, secured in the hands of a crew of 5 in 2016.